– In a human-intervention trial published recently in the journal Nutrients, researchers at the USDA, ARS, Beltsville Human Nutrition Research Center, looked at the available energy content in cashew nuts. Eighteen healthy volunteers were recruited to participate in this 9-week study. 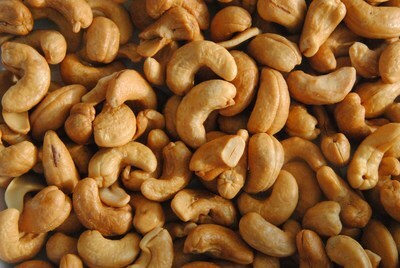 Participants consumed a controlled base diet supplemented with cashew nuts (42 g/day) during one treatment period of 4 weeks, or a controlled base diet with no-cashew supplementation during another treatment period of 4 weeks. Diet samples from the study, as well as feces and urine from eighteen volunteers, were collected during the final week of each intervention phase and analyzed for protein, fat and energy content. From these, researchers were able to determine the actual digestible energy content of cashews. Study results showed that the available energy (calorie) content of cashews is 16% lower than that which is typically stated on current food labels and databases in the United States, including the National Nutrient Database for Standard Reference. These must be corrected in order to provide consumers with accurate energy values. Whereas the current reported energy value is 163 kcal/serving, USDA researchers found that the metabolizable energy content of a 28 g (1 oz) serving of cashews is 137 kcal. Meanwhile, another recent study published in The American Journal of Clinical Nutrition concluded that 42 g/day of cashews does not increase LDL “bad” cholesterol levels. The study also observed that adding 42 g of cashews every day to a typical Western diet may help reduce the enzyme PCSK9, and lower PCSK9 concentrations are associated with the removal of LDL “bad” cholesterol from the blood. This study was supported by the Global Cashew Council and the INC International Nut and Dried Fruit Council. 1. Baer, D., & Novotny, J. (2019). Metabolizable Energy from Cashew Nuts is Less than that Predicted by Atwater Factors. Nutrients, 11(1), 33. 2. Baer, D. J., & Novotny, J. A. (2019). Consumption of cashew nuts does not influence blood lipids or other markers of cardiovascular disease in humans: a randomized controlled trial. The American Journal of Clinical Nutrition, 109(2), 269-275.